Hitting a golf ball correctly requires turning your shoulders. Correctly hitting a golf ball takes coaching and practice. Seeing a local PGA professional will help ensure that you're performing the proper sequence of motions. Once you have them down, it's all about practice. 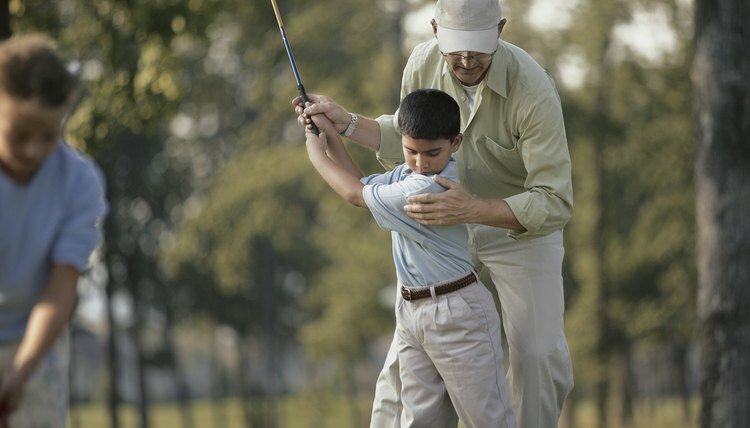 Practice will develop muscle memory so your swing can be repeated. This article is written for right-handed golfers. If you're left-handed, switch "right" and "left" in these instructions. Grip the club so that the shaft runs along the base of your fingers to ensure a neutral grip with your palms facing each other. The thumbs on each hand should point down the shaft. The V's that are formed with each hand's thumb and index finger should be parallel and pointing toward your right shoulder. Set up to the ball and align your body at the target. Your feet should be shoulder-width apart and your weight centered between your feet. Flex your knees and keep your back straight. Swing the club back with your shoulders and let the rest of your body coil in response to what your shoulders are telling you. At the top of your back swing your weight should be on your right foot. Start the down swing with a forward shift of your body weight onto your left foot. This will put your arms in the correct position to hit the ball from the inside and help combat a slice. Rotate your shoulders on the down swing. This will provide the club head speed and help you to properly release your hands after contact with the ball. Swing to a full finish with your chest facing the target, and keep your balance. What Role Does the Right Shoulder Play in the Golf Swing?